Charles I's head had been off his shoulders for six weeks when John Milton accepted the office of Secretary for Foreign Tongues to the Commonwealth Council of State. He had announced his approval of the execution in a pamphlet which came out within a few days of the event and throughout the struggle between Parliament and the King he had been a vigorous anti-Royalist polemicist. He was now forty years old, a slender man of middling height and delicately fastidious ways, who had earned the sneering nickname 'Lady' at Christ's College, Cambridge. He had subsequently abandoned early thoughts of becoming a lawyer, travelled in Italy and called on Galileo, published poems in Latin and English (including the superb 'Lycidas'), earned a crust by taking private pupils and inherited money from his London scrivener father. He had written trenchantly in favour of both freedom of the press and divorce for incompatibility, his own lively young wife, Mary Powell, having found him so intolerable that she went home to her parents and refused to return. He was also rapidly going blind. Latin was still the language of international communication in 1649 and 'foreign tongues' in practice meant Latin. Milton's new job, which carried a salary of £288 a year (at least £60,000 today) with two assistants and quarters in Whitehall, involved him in translating official communications with foreign governments into Latin and translating the replies into English. As few foreign governments wished to have much to do with the regime in England, Milton could spend his time writing propaganda tracts for his employers. One of them was Eikonoklastes ('The Image-Breaker'), which came out in October, 1649. It was a counterblast to the Eikon Basilike ('The Royal Image'), believed to be an account of the last days of his life by the martyred Charles himself, which was treasured as virtually holy writ in many Royalist households. Milton also supervised the pro-government newspaper Mercurius Politicus. He wrote little poetry during this period of his life. Finding he could work largely at home, Milton took a house in Petty France. From there he would walk to his Whitehall office across the park, but his sight was growing steadily worse and by 1652 he was totally blind and needed someone to lead him about. He now dictated to a secretary and seldom went to Whitehall, the bulk of his official work being done by his deputy, a German poet named Georg Rudolph Wecklein, who was succeeded by Philip Meadows and from 1657 by the poet Andrew Marvell. Though his salary had been reduced in 1655, Milton still had his government appointment at Cromwell's death in 1658, when at the state funeral three great poets, Milton, Marvell and Dryden, walked together behind the Lord Protector's coffin. 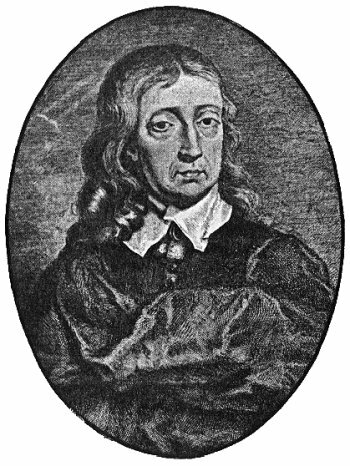 Milton remained Latin Secretary and apologist for the regime until 1660 and the restoration of the Stuarts, which he passionately opposed in print. Under the new regime Eikonoklastes was solemnly burned by the public hangman and its author was imprisoned, but Marvell's influence may have helped to protect him and he was soon released. Now in his early fifties, he took a new wife and retired into private life to publish his History of Britain, finish Paradise Lost and write Paradise Regained and Samson Agonistes.